A senior Israeli diplomat in Washington has met with a Pentagon analyst being investigated by the FBI on suspicion he passed classified information to Israel, Israeli officials confirmed Monday. They reiterated, however, that Israel does not have a spy at the Pentagon. Israeli Foreign Minister Silvan Shalom said meetings between Israeli embassy employees and U.S. government officials are commonplace, and that the two governments routinely share secrets. "Israel and the United States have intimate ties ... and the information being exchanged is much more classified than any conversation that may have taken place," Shalom told a news conference. U.S. officials say the FBI investigation focuses on Lawrence A. Franklin, an analyst of Iranian affairs who works in a Pentagon office headed by Douglas J. Feith, the undersecretary for policy. Feith has been accused by Democrats of seeking to manipulate intelligence to help make the case for going to war in Iraq. Congressional investigations have found no evidence of that. The Israeli diplomat was identified as Naor Gilon, head of the political department at the Israeli Embassy in Washington, and a specialist on Iran's nuclear weapons program. Shalom did not mention Gilon by name, but when asked about contacts between Gilon and Franklin, he did not deny they had taken place. The Israeli daily Maariv on Monday quoted Gilon as saying that he did nothing wrong. "My hands are clean. I have nothing to hide. I acted according to the regulations," Gilon said. The diplomat told Maariv he was concerned that as a result of the reports, he won't be able to continue working in Washington. "Now, people will be scared to talk to me," the newspaper quoted him as saying. Newsweek magazine reported in this week's edition that more than a year ago, the FBI was monitoring a meeting between an Israeli Embassy official and a representative of the American Israel Public Affairs Committee, the main Israeli lobbying group in Washington. At one point, Franklin joined the two, according to Newsweek. Newsweek did not identify the Israel diplomat, but Israeli media said it apparently was Gilon. Israeli officials said Gilon has met repeatedly with Franklin. Newsweek, citing U.S. intelligence officials, said that Franklin on one occasion allegedly tried to hand over a classified U.S. policy document on Iran, but that the Israeli diplomat refused to take it. Maariv quoted Israeli sources as saying that Gilon did not take documents from Franklin, but had frequent meetings with him. Israel's Foreign Ministry declined comment. The Israeli ambassador to the United States, Danny Ayalon, told Maariv that Gilon went by the book, and that "nothing was done under the table." The New York Times reported in its Monday edition that government officials say Franklin had been cooperating with federal agents for several weeks and was preparing to lead them to contacts inside the Israeli government when work of the investigation, first reported by 60 Minutes Correspondent Leslie Stahl, was leaked late last week. Efforts to reach Franklin by telephone have been unsuccessful. On Sunday, Israeli Cabinet minister Natan Sharansky said he believed the allegations might stem from an internal conflict between the Pentagon and the CIA. "I hope it's all a mistake or misunderstanding of some kind, maybe a rivalry between different bodies," Sharansky told Canadian Broadcasting Corp., singling out "the Pentagon and the CIA." American officials said the FBI has spent more than a year investigating whether a Pentagon analyst funneled classified material to Israel. The material described White House policy toward Iran. Israel says Iran — and its nuclear ambitions — pose the greatest threat to the Jewish state. 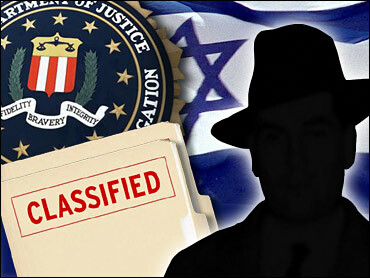 Sharansky said the ban on espionage in the United States dates to the scandal over Jonathan Pollard, an American Jew caught spying for Israel in 1985. "There are absolutely no attempts to involve any member of the Jewish community and any general American citizens to spy for Israel against the United States," he said. Prime Minister Ariel Sharon's office issued a denial late Saturday, saying "Israel does not engage in intelligence activities in the U.S."